M.Sc.(Tech.) Salla Jaatinen will defend the dissertation “Carbon Catalysts in Biofuel Production: from Furfural to 2-Methylfuran” on 29 March 2019 at 12 in Aalto University School of Chemical Engineering, Department of Chemical and Metallurgical Engineering, lecture hall Ke2, Kemistintie 1, Espoo. On March 19, 2019, I gave an invited tutorial at the ALD for Industry event by … In an Open Teaching atmosphere, I created a Panopto record of the talk and the talk is shared openly. The publication of the slides in SlideShare & video in Youtube waited for the publication of the review article: Conformality in atomic layer deposition: Current status overview of analysis and modelling, by Cremers, Puurunen & Dendooven, Applied Physics Reviews 6, 021302 (2019); https://doi.org/10.1063/1.5060967. 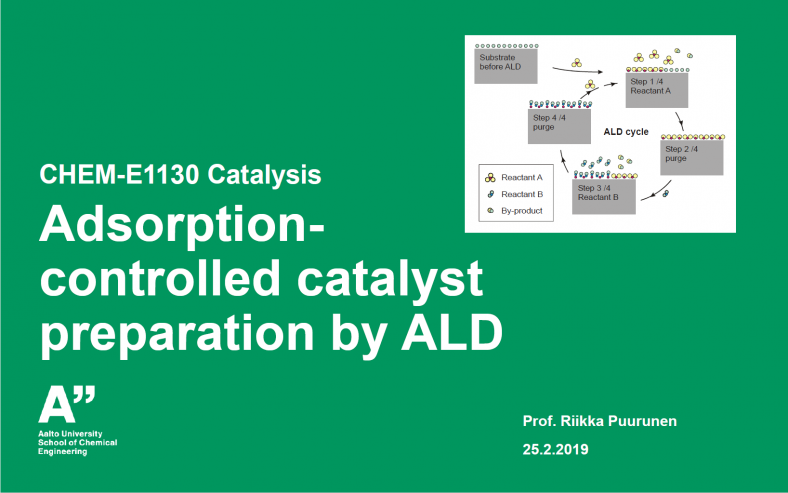 Lecture capture shared in an Open Teaching way: CHEM-E1130 Catalysis course, by Prof. Riikka Puurunen: Adsorption-controlled catalyst preparation by ALD (atomic layer deposition). Being on tenure track at Aalto University, I need to follow pedagogical studies – which is great! One of the on-going activities is “teaching partner” with my own pedagogical mentor. I get to do trials with teaching – these are planned with justification, made, and afterwards, reflected. A perfect learning cycle. 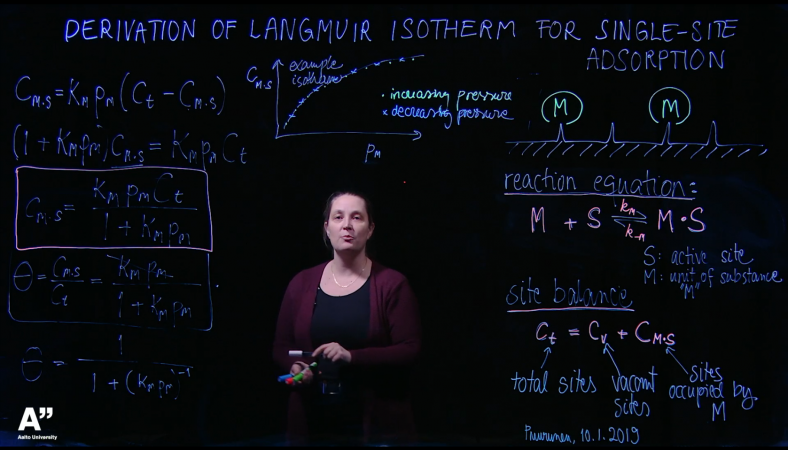 Today, I made the first such trial, and went through the derivation of the Langmuir adsorption isotherm (single-site adsorption) with the lightboard system that has been built at Aalto Studios. Here, we are following the Nothwestern University model. Scientific articles have been written on the technique, e.g., Journal of Chemical Education 2017 https://pubs.acs.org/doi/10.1021/acs.jchemed.7b00004. The result is openly shared through the Panopto platform, screen capture below and link here: https://aalto.cloud.panopto.eu/Panopto/Pages/Viewer.aspx?id=2d56ca40-7ab8-401e-80e9-a9d100a13c1d. The video is also available in Youtube. This was my first trial and I am happy with the outcome, even though not everything went quite as planned.. watch yourself to know what I mean :). (It was all captured in just one recording, without too much planning, and a bit of roughness is fine in the video, I think.) 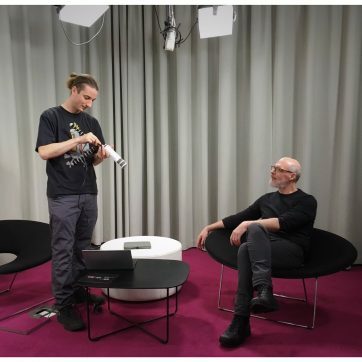 Warmest thanks to Aalto Studios and Kalle Kataila for making this possible and for providing the video extremely fast. Description of the video, which is included in the Panopto recording, is copied below. Year 2018 approaches its end, and it is a good time to look back on the activities of our group in 2018. Publication-wise, the Aalto Catalysis research group has had a good year. In total ten publications from the current group members and related earlier research at Aalto are out, listed at the end of this email. At the moment of writing this, five articles are “in the pipeline”, to be published in 2019 after peer review is finished (one of them shared in ChemRxiv). The group members have additionally given several contributed/invited/keynote talks and poster presentations at various national and international conferences. Aalto CHEM doctoral student Giovanni Marin with colleagues has set up a professional-looking podcast STG Podcasts, where STG refers to “Science, Technology and Gaming”. There are several episodes already where scientists working with Atomic Layer Deposition (ALD) have been interviewed. The most recent episode is with Prof Seán Barry recorded on November 27, 2018 (see also the lecture info), and there have been earlier ones of Prof. Christophe Detavernier, Dr. Simon Elliott, Dr. Esko from Picosun, and Prof. Gregory Parsons. I warmly recommend listening to these! You find STG Podcasts for example in Twitter. Giovanni Marin and Seán Barry in the Aalto selfservice studio, for STG podcast. Photo: Riikka Puurunen 2018. The lecture will be on Tuesday, November 27, 2018, in lecture hall Ke 2 (Chemistry building, Kemistintie 1), at 10:00-11:00. Welcome!